First, baby legs. 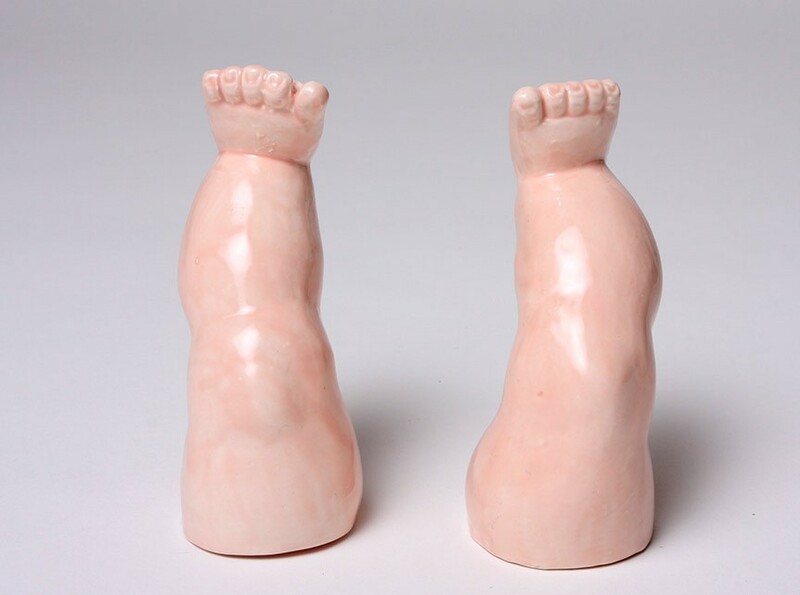 Yes, that’s right – these ceramic baby legs are actually salt and pepper shakers. Apparently, they are guaranteed to be the talk of your baby shower party table, but I say don’t stop there – these babies should be out and about at every opportunity. Sprinkle salt on your potatoes with the baby’s left foot, and a little pepper for your steak with the baby’s right foot. And when the legs are running low, just remove the stoppers in the baby’s thighs and fill ’em up! 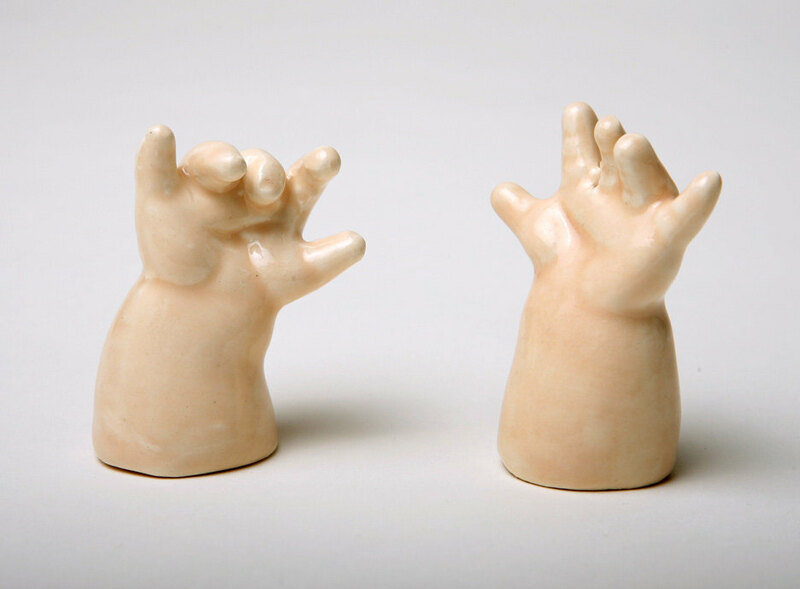 Or if you’d prefer, there are ceramic baby hands salt and pepper shakers in the collection. Maybe just buy both and complete the set with a ceramic doll to store your dried herbs? Creepy. 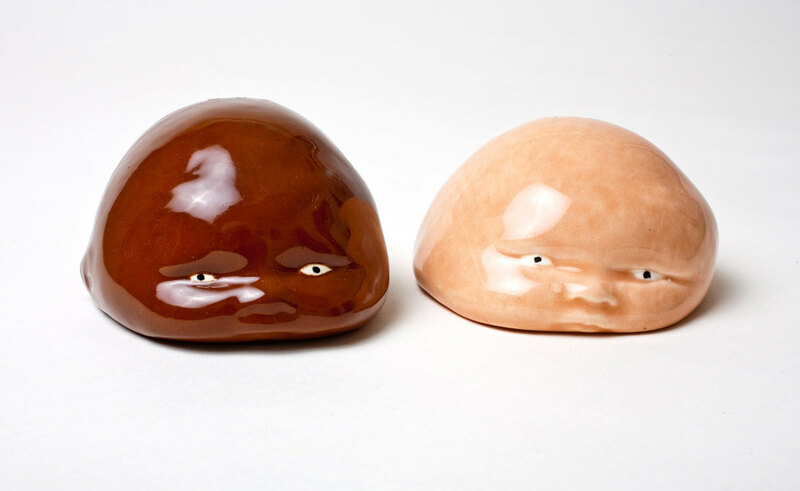 Continuing on the baby theme, here are Baby Puddin’ heads, which also take care of your salt and pepper needs. I am not sure that you could keep any of these on the table during dinner without scaring your guests. But then, I don’t really know your friends that well, perhaps they already have these in their kitchen! These are all from the Modern fx store on etsy, along with some other perculiar salt and pepper shakers – featuring Colonel Sanders of KFC fame, JFK and Jesus. But I’ll leave you to look for those if they sound like your thing. 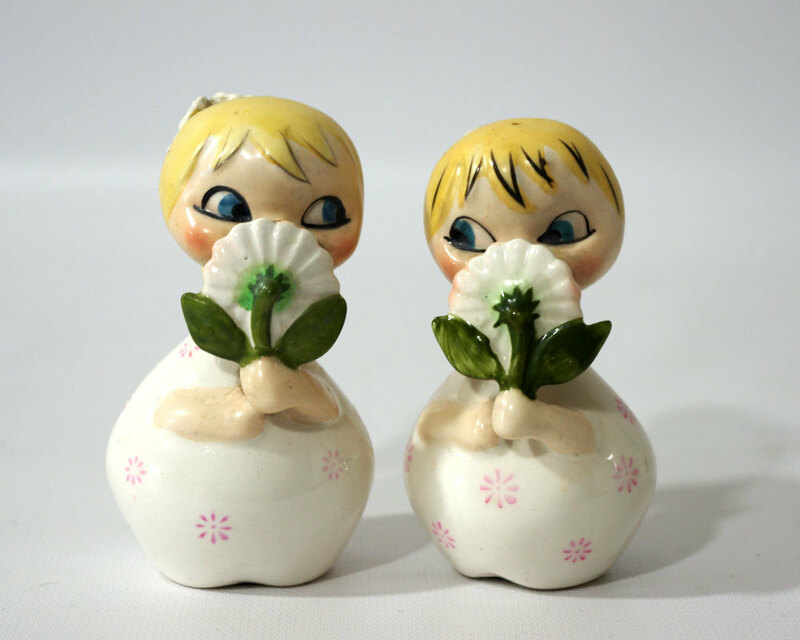 These two ladies are apparently a darling set of vintage Holt Howard salt and pepper shakers from the “Daisy ‘Dorables” line. They are a pair of blonde pony-tailed girls holding large daisy flowers in front of their faces. Maybe it’s just me, but I think they’re a bit shifty looking. And I would be worried that they’re sitting on the table, listening to all the conversations and gossiping about us behind their giant daisies. You can check them out at Gizmo & HooHa, the vintage emporium. 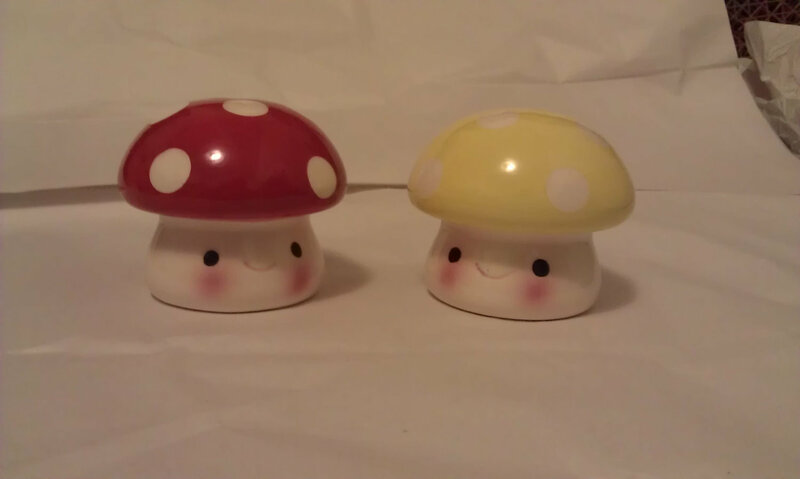 I prefer these cute little guys from SuperRetroChic – they look like something out of Super Mario Bros and would definitely brighten up the table, without freaking out your dinner companions. Unless, of course, you are dining with Super Mario and Luigi, in which case, they will probably try to smash these with a hammer or something. 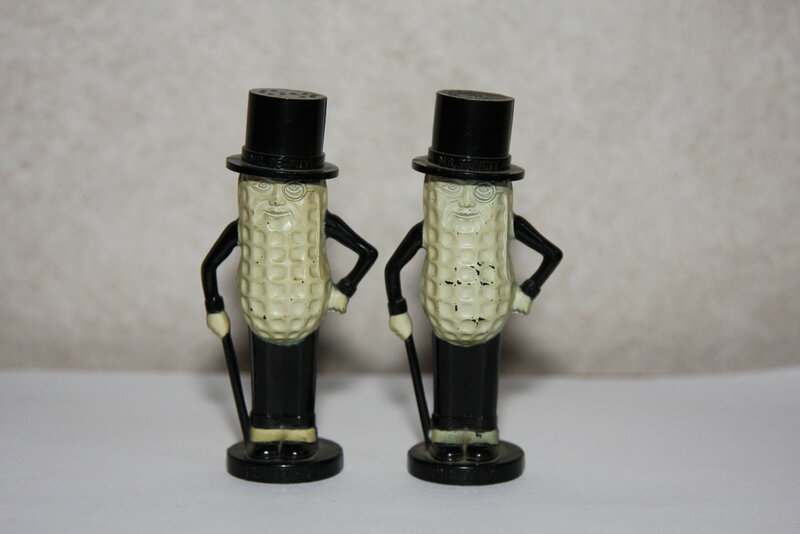 But now, to finish with my favourites – vintage Mr Peanut salt and pepper shakers. They’re not in perfect condition, but they make me laugh. And if they can still dispense salt and pepper after all this time, with their top hats and canes, I say these will add a touch of class to any home. Ye olde peanuts are available from Olde Tyme Memories on etsy. mmmmm….it would be strange using the baby items while having chicken legs!